Hi everyone!! Since today was the actual book release date for Love Always, there were a lot of activities that were planned for the release, including a book blitz, where several blogs will post the book information, excerpts, teasers, and more to help launch the book. I also launched a giveaway through Rafflecopter for a $25 Amazon gift card as well as the entire eBook collection of the series. Since it’s midnight in my neck of the woods, I will be posting my own blitz first! From the first moment I’d laid eyes on Shawn Walker, I never thought he would be the love of my life. In the three years we have been together, we have been through so much, and I couldn’t imagine anyone else I would have wanted by my side. Now, we’re about to experience another event that has us both in shock. Will we be able to get through this one together, or will it end up destroying our relationship? I never thought I would experience love again until Riana Robertson entered my life. The two of us have been through hell and back, but we’re still standing. Now that I’ve graduated Shaw and heading into the real world, I have a lot of responsibility, not just for myself, but for my growing family. With all of the issues surrounding Riana and me, will we slowly lose sight of the love we have for each other, or will it strengthen us as a couple? In the three years Shawn and I had been together, we had our share of ups and downs. But through the good and the bad, we’ve stuck by each other, and our experiences helped us grow; not just as a couple, but as individuals. I knew the two of us could get through anything together. Especially with the love we had for each other. Now and always. Sheena Binkley first discovered her love for storytelling when writing her first story for a class project at the tender age of nine. Since then, she has composed several short stories and numerous tales that are not only engaging, but simply entertaining. She is also a freelance writer, penning articles on various topics including education and entertainment. Besides writing, she loves reading, shopping, and spending time with family and friends. She lives in Houston (where the weather is always unpredictable) with her husband and son. Where did the idea of Love Always come about? 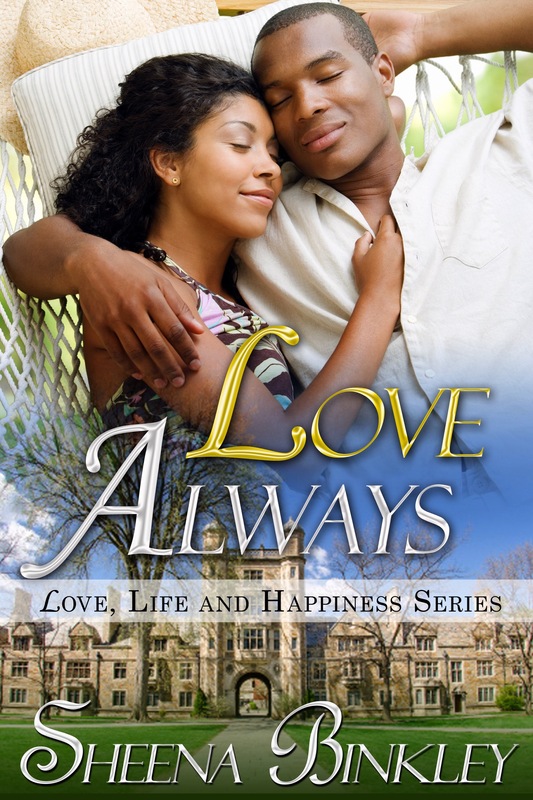 Love Always is the fifth book in the Love, Life, & Happiness series and it’s the second book for one of the couples, Riana & Shawn. The story takes place three years after they met and it shows how much their relationship has evolved. They been through so much in their relationship and now, they have an even bigger test they have to endure. It will show whether their relationship will become stronger or will it destroy them. With the series, each book was devoted to a couple and their journey to happiness. Why were two books written about Riana and Shawn? Although I love each of the couples in the series, there were so much more to tell regarding Riana and Shawn. Their relationship is very special and unique that I had to do another story on them. Also, readers of the series love these two and wanted to have an update; so another story was born. Since this is a part of a series, do you need to read the first four books? Not necessarily. This story does provide enough background for first-time readers to understand the storyline and the couples; but it would be more beneficial if readers read the first four to see the journey each couple (especially Riana and Shawn) went through to understand where they are now in their relationships. What was your favorite part in writing Love Always? I have various scenes that are my favorite with Love Always. In fact, I love the entire story, because it shows how powerful love can be. Also, this book is important to me because it’s has some real-life elements to Riana and Shawn with myself and my husband. Some of the lessons this couple has been through was similar to some of the situations my husband and I faced at their age, so it brought back various memories during my college days a few years ago. Will there be any other stories coming soon from the series? Yes, Actually, Love Always was supposed to been the final book in the series, but I couldn’t let these characters go; so I decided to write one more story, titled Redemption. This will be a novella and will be from one of the most hated (but misunderstood) characters from the series, Nathan. Several questions will be answered in this story, so hopefully everyone would understand his point of view on some of the situations that has occurred between him and with several characters. Along with Redemption, I am working on a new series titled Resisting Temptation. I am also working on a spin-off from the Love, Life, & Happiness titled Simply Love. Both series will be available next year.